Let’s Celebrate Farm to School Month! It’s official: October is Farm to School Month in Hawai’i! 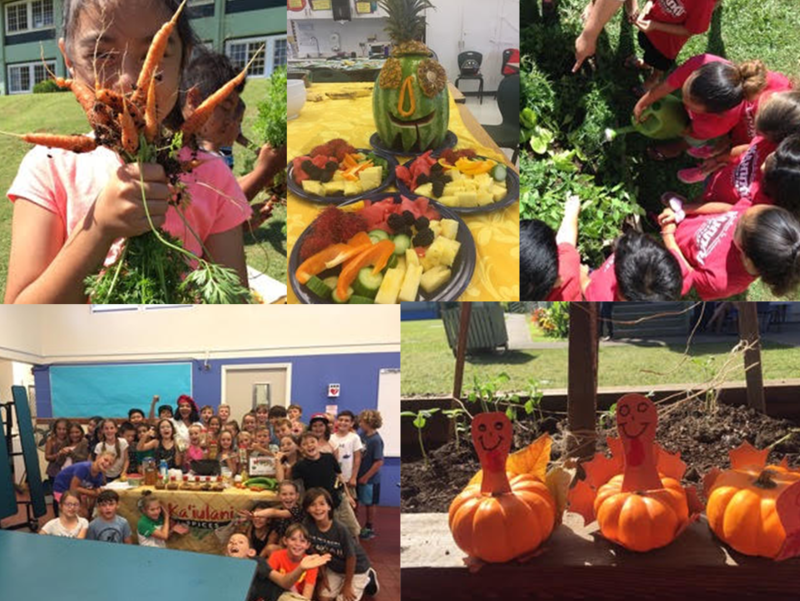 Through collaboration amongst the Hawaiʻi Farm to School and School Garden Hui, Hawaii Department of Education (HIDOE), the Hawaii Department of Agriculture (HDOA), the Kohala Center, the office of the Lieutenant Governor, and many partner organizations, Hawai’i has joined the cohort of states that officially recognize October as Farm to School Month statewide. Farm to School Month is an initiative first introduced in 2010 by the National Farm to School Network (NFSN), an alliance that spans across all 50 states, Washington D.C. and U.S. Territories. The message is simple: empower children and families to make informed food choices for a healthier community. Whether this involves local food sourcing in schools, learning gardens, agricultural and nutrition education, or other engagement with the food system, the NFSN is a hub for people who wish to improve the health and wellness of their communities. This month, join the movement and support schools and communities moving towards a healthier future. If you volunteer with an ‘ĀINA School, be sure to stay in the loop on upcoming Chef Visits, Farmer Visits, Environmental Field Trips and more happening on elementary school campuses all over Oʻahu. Schools can engage by planning special events to highlight healthy food on campus. Create a “Harvest of the Month” taste test in the cafeteria or organize a farm field trip to get kids engaged with local agriculture. Hashtag your Farm to School photos and activities #CHOMP on social media to let us know what you’re up to and your photo may get on the KHF Instagram. Teachers can work with parents to source fun, fresh options for Halloween treats like “Guacobats” and “Fruit-O-Lanterns”. Check out this “Tricks to Healthy Halloween Treats” blog post to explore more fun, healthy options. Families can take part in Farm to School Month by supporting local agriculture, cooking with seasonal produce, and volunteering with school and non-profit garden and nutrition programs. Visit a farmer’s market or get in touch with your school about a Community Supported Agriculture (CSA) program. Some CSA’s even donate a portion of subscription costs back to the school! Communities can join in on Farm to School Month by lending expertise in the classroom and outdoors. Local Chefs are excellent resources for cooking demonstrations, introductions to career pathways, and engagement with small businesses. Farmers and cultural practitioners, can be brought into the school network to share about their experiences and professions. To learn more about how you can get involved with Farm to School Month events happening at a school near you, contact [email protected] to find out what’s growing in your community.